﻿Travel provides so many opportunities for cultural insights. It’s easy to find them via the historic, artistic, and culinary experiences that most people encounter. But how much do you pay attention to the stuff of everyday life in a town you’re visiting? ﻿Let yourself be mesmerized—like I recently was in Salzburg’s Altstad, or Old Town—by workaday activities that might be done differently than where you live. You might just get an insight into how a culture thinks and operates. 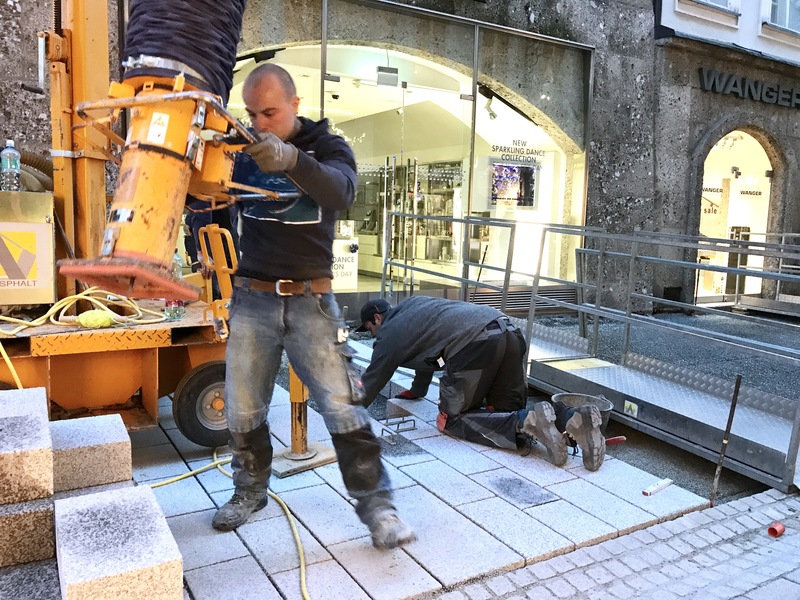 While on a guidebook research mission in the historic center on Getreidegasse, I had to stop in my tracks because two guys and crazy-looking machine were doing something I’d never seen before—making a road with concrete blocks and a suction cup. It made me think about the Austrian work ethic, technology, and efficiency and how it might be helpful in the U.S.. The paving technique requires few workers, can be done quickly, and, if later down the road, repairs need to be done to pipes or wires or whatever’s below the pavement, a small section can easily and neatly be removed and replaced instead of jack-hammering an eyesore of a hole. And while this technique or mindset might not be embraced in other countries, it seems like a smart option to consider. Next Post Join me and my friend Sarah (adventures with sarah.net) as we check out the scene in London’s Theatre District during Pride.